Although the “inch-a-week” recommendation is often cited as a rule of thumb, the truth is that plants vary widely in their water needs. Young seedlings and new transplants have limited root systems and need a consistent supply of moisture, so they may need daily watering if the weather is sunny and hot. Established trees and shrubs, on the other hand, may need supplemental watering only during extended dry spells because they have root systems that are more extensive. The amount of water a plant needs depends on a number of factors, including the type of plant, its stage of growth, type of soil, weather and time of year. The best way to water most plants is by applying enough to moisten the plant’s entire root system, and then letting the soil dry out slightly before watering again. Apply water slowly so it’s absorbed by the soil rather than running off — a soaker hose is ideal. Avoid daily light sprinklings, which encourage roots to grow near the soil surface where they’re vulnerable to drying out. Yes, wilting is a sign that the leaves aren’t getting enough moisture, but that doesn’t necessarily mean that the soil is dry. Anything that damages plant roots can cause wilting. Plant roots need a fairly constant supply of both air and water. Too little water and the roots die from lack of moisture. Too much water and the spaces between soil particles remain filled with water, suffocating roots. Both situations reduce a plant’s ability to deliver enough water to stems and leaves, resulting in wilting. Root diseases, physical damage (such as disturbing roots while you’re hoeing) and soil-borne insects can also harm roots to the point that they can’t fully hydrate the plant. Damage to stems can also cause wilting. Some diseases and insects (especially borers) prevent water distribution throughout the plant, causing some or all of it to wilt. The only way to tell if lack of water is causing wilting is to check soil moisture. There are good reasons to avoid watering your garden on a sunny afternoon, but causing scorched leaves isn’t one of them. The myth that water droplets act like tiny magnifying glasses and burn plant leaves has no basis in fact, and anyone who has watched the sun come out after a summer shower knows that the water quickly evaporates. Leaf damage can be caused by all sorts of things: too much or too little soil moisture, fertilizer burn from improperly diluted synthetic fertilizer, insect or disease problems, and weather conditions, such as wind or frost, to name a few. Try to avoid watering on sunny afternoons to minimize the amount of moisture lost to evaporation, but don’t worry about leaf scorch. 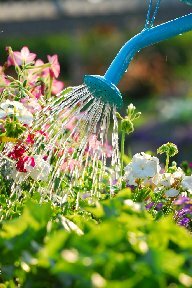 It’s usually best to apply water directly to the soil around plants rather than watering with a sprinkler. Less water is lost to evaporation, especially on hot, sunny days. Foliage stays dry, minimizing disease problems. However, there are times when an overhead shower is called for. During dry, windy weather, a fine layer of dust can build up on leaves, reducing the plants’ ability to photosynthesize efficiently. Some insects, including aphids and spider mites, can be kept in check by simply hosing them off plants. Finally, heat-stressed plants that have wilted even though their roots are moist can benefit from a cooling shower — the effect won’t last long on a sunny day but it may provide some relief. Overhead watering isn’t the most efficient from a water conservation standpoint, but there are times when it’s called for. Many young echinacea, sedum and black-eyed Susan plants have perished because these “drought-tolerant” plants didn’t get sufficient water at planting time and during their first season of growth. When you set out a new container-grown plant, the roots are confined to the shape of the pot. The plants need a consistent supply of water during their first growing season, until their roots grow out into the surrounding soil. Water them as you would your annual flowers in their first season. During their second and subsequent growing seasons, drought-tolerant plants may need supplemental water only during extended dry spells. Note, however, that just because a plant is drought-tolerant doesn’t mean it doesn’t fare better with a regular supply of moisture. We have ignored the myths. We do the correct watering as needed! That is good! Keep up the good watering. It is very dry right now. Thank you for your comment. Thank you for your question. Overhead irrigation systems should be run in the morning just before sunrise. This will allow the water to soak into the ground before the sun comes up and evaporates it. Avoid daily shallow watering, which will keep the roots from growing deeper. Use the system to water deeper (run longer) every other day or three times a week. That will help the roots reach deeper in the ground.